In 2009, Gregory Lee‘s life almost took a decided turn with his discovery of the designer toy movement. Already an established screen printer, Lee had spent the better part of a decade applying his hands-on learned craft within the apparel industry, employed by the likes of NTD Apparel, Junk Food Clothing, and Juicy Couture. But as both he and his wife quickly gravitated to designer toys, they decided to undertake a new endeavor: opening their own retail store in Canada dedicated to this art form. These plans ruined by a sudden downturn in the economy, they returned to Lee’s hometown of Los Angeles and the form of employment Lee was already accustomed to. But, in 2011, they relocated to what they deemed a more desirable locale to raise their daughter: Boise, Idaho. With this fresh start allowing Lee to devote not only more time to his family but also his own art, which he created under the alias GregLovesToast, he began exploring designer toys as a form of personal expression. And though he only produced a handful of hand-modified works during his short tenure in the scene, his oeuvre from this period remains a testament to his skill and creativity. Just before the end of 2011, Lee publicly revealed his Raffy the Goat (Brimstone Edition) creation, featuring the artist’s hand-painted decoration on a Kidrobot-produced Munnyworld vinyl form. Depicting an “evil goat”, one whose aesthetic was most likely inspired by the artist’s appreciation for heavy metal music, the bold lines and crisp coloration of this one-of-a-kind piece were meant to become indicative “of a larger series”. And while Lee did begin work on at least a second Raffy form using this patterning, it would become more of an anomaly in his brief career, his designer toy sculptural aesthetic being commonly remembered for a style he’d been simultaneously exploring. Innovating a carving technique on designer toy vinyl forms, Lee began experimenting with a time-consuming process of using a Dremel, X-Acto knife, and sandpaper to cleanly create pieces with excised aspects. 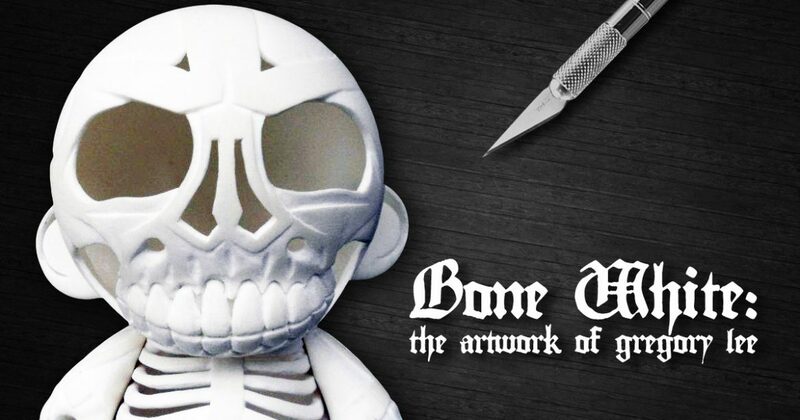 His first known work in this direction is the 7″ Skull Munny, its skeletal appearance created without adding sculpted parts to the original form or gluing any elements in place. And even though he’d begun work on this piece as early as November of 2011, the process of creating a strictly carved work along these lines took longer than Lee expected, his finished version being revealed almost two full months later. Most likely fueled by his love of fantasy, gothic, and horror aesthetics, Lee began work on new “undead skeleton” pieces using this process in the first half of 2012. Photographed during their work-in-progress states, the bestial Raffy Skeleton (Cutaway) and knight-based 4″ Medieval Mini Munny (Cutaway) reveal a continued evolution of this vinyl carving direction. Creating a stunning overlapping effect with the lower jawbone of the Raffy piece, the intricate details on the Mini Munny are breathtaking, especially the carved skull decorations adorning the knee joints in its faux armor. And while pictures of finished versions of these works weren’t publicly shared by the artist, there was work that Lee photographed in a completed state in the interim. Even though some promotional announcements for the Playsam 500 and So So Happy × Toy2R Custom Qee Project exhibitions announced Lee as participating, the only exhibit his work is known to have been displayed at was the Mickey Mouse Vinyl Art Figure: Custom Showcase. Taking place from April 6th-15th, 2012 at Singapore’s Suntec City, this showcase featured an international array of over 100 artists that each hand-painted and/or otherwise modified Disney-approved Mickey Mouse vinyl figures that were produced at the time by Play Imaginative. Lee’s contribution was titled Grim Grinning Mickey, its sinister and skeletal cutaway patterning accented by four monstrously fang-like teeth. A stunning design on the roughly 6½-inch tall form, Lee also created a production design submission based on this concept, the excised appearance theoretically mimicked through proposed factory-painted decorations over a glow-in-the-dark vinyl base. And while no further designer toy works by Lee are known to exist, the artist since having moved back to Los Angeles with his family, it is a wishful and hopeful thought that his Facebook update from August 1st, 2012 remains true; for, at that moment, Gregory Lee was still “carvin’ vinyl”.